Search over 10 Bible Translations, hundreds of early Church doctrines, and over 1500 classics covering 2000 years of Christianity all at one time. Read what the Fathers and Doctors wrote about any particular passage in Scripture. Know how to defend your Faith using quotes from the Scripture and Early Church Fathers. Contains over 1500 writings, 75,000,000 words & 80,000 pages. Many classics including Gibbons' "Faith of our Fathers," Thomas a Kempis' "Imitation of Christ" and John Paul II's "Theology of the Body"
Several public domain Bible translations are included with the Faith Database, including the Douay-Rheims, the King James Version, and several copyrighted translations. You can search all of the translations from the Faith Database, but you will need Internet access to read the copyrighted translations. 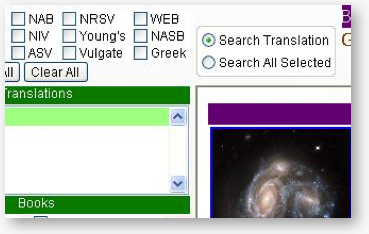 You can search for words and phrases or specific passages within any or all of the available Bible Translations. You can click on the "R" next to each verse and see what the Church Fathers and Doctors wrote about a particular verse. 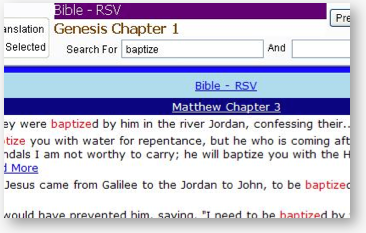 More than ten Bible translations are included with the Faith Database, including the Douay-Rheims and the King James Version. 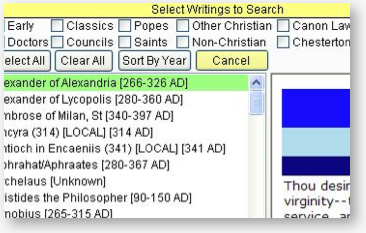 You can search documents from all 21 Ecumenical Councils and several local councils. Internet access required to read documents from Vatican II. 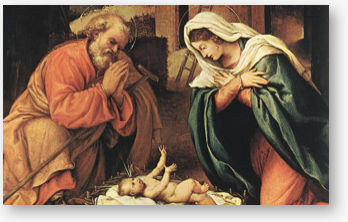 Over 1000 images of Bible art are included with your Faith Database. Over 400 writings from the Didache to Clement to Augustine to Jerome. The Summa and many more writings from the Doctors of the Church. Over 100 Bible maps will help you visual locations and journeys detailed throughout the Bible. Classic Christian writings from Thomas a Kempis to St. Thérèse of Lisieux. Complete writings of these two literary greats. 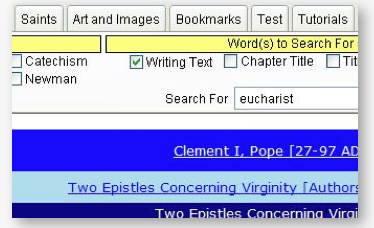 Over 1300 Papal writings and Encyclicals to search from. Access a large collection of conversion stories. A true classic is now at your fingertips. "A wealth of Priceless information at your fingertips, I don't leave home without it." "This database is incredibly easy to use! The Bible cross-referenced with the Church Fathers, and much more." "The Faith Database is an amazing resource. It is hard to believe that so much useful information can be contained on one disc." Ensure your Faith Database is up to date. Download the Faith Database Patch free! Faith Database Patch #3 (11.3 MB, 2/9/2011, contains Patches #1 and #2) Save file for possible future needs. 1. I haven't received my email confirmation for my Download. Can I still download? 2. The disk keeps spinning when I am trying to install. Why doesn't the Installation Wizard display? In some cases the Installation Wizard can take up to 10-15 minutes to display. 3. What should I do if I have problems installing the downloaded program? In some cases the file you’ve downloaded will have the “.exe” file extension dropped. Simply rename the local file and add “.exe”, then double-click on the .exe file to install. 4. When will the new Mac version be available? 5. How much is the network version license fee? The 30-user network license will be $339.95. You will be able to receive a CD or you will be able to download the network version program from the website. The network version will run on Unix, Linux, Mac or Windows and will require both MySQL and Apache to be already installed on your server. A release date is not available at this time. 6. Can I make a back-up of my Downloaded version? After downloading this software, you should make a back-up copy on a CD or other back-up media in case you need to reinstall it. The file name is fdbsetup.exe---when downloading we recommend choosing Save instead of Run, and save the file to a location where you can find it when you are ready to make your back-up copy. 7. If I must reinstall what are the correct steps to do so? 8. Will I lose my Bookmarks if I uninstall my Faith Database software? After you reinstall you will need to copy these files back to the FDB directory. 9. Do I need to store the Faith Database at the default directory, or may I store it at another location? For a successful installation process it is necessary to store the Faith Database at C:. This is the default directory. Some of the writings are downloaded from the internet and they will look to store themselves at C:\FDB folder. 10. I have experienced an error message during the installation of the Patch, should I click Cancel, Ignore or Help? 11. I have experienced an error message during the installation of my Download Version, should I click Cancel, Ignore or Help? Please see steps for #13 above. 12. I'm a Netbook user, and I am unable to scroll all the way to the bottom, what can I do? Netbook type screens are smaller with generally a resolution of 1024 x 576. The Faith Database requires a resolution of a least 1024 x 768. We do not recommend use of the Faith Database on mini-screen type computers. 13. I have tried everything to install my Faith Database CD, but it just won't install correctly, now what? Because the Faith Database is stored on your C: drive you might find it necessary to "run as Administrator" for a successful installation. 14. What are the proper steps for adding the Add-On Title files? Human Life International presents the world’s first pro-life library on compact disc. Fully indexed and cross-referenced, it contains thousands of documents totalling over 10 million words - equivalent to more than 50 large books. Does the Church really perform exorcisms? Not only do priests still drive demons out of possessed individuals, but the coming years will see a dramatic increase in the need for exorcisms! So says world renowned priest and exorcist Fr. Thomas Euteneuer. If you - or someone you know - has ever wondered about the existence of the devil and evil spirits, it's time to put those questions to rest once and for all. 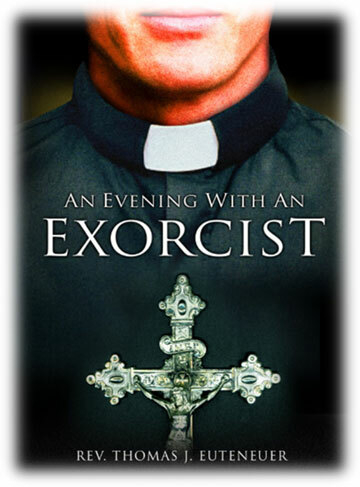 An Evening With an Exorcist is an eye-opening audio set destined to change the way you view the influence of Satan and his demons - and the divinely-instituted power that the Catholic Church, through her bishops and priests, has to command evil spirits to flee from those who are possessed or simply plagued by demons. Make sure you and everyone you love listens to this important audio set! Rev. Thomas J. Euteneuer is president of Human Life International, the world's largest pro-life organization. He has traveled more than 500,000 miles as a pro-life missionary and visited more than forty countries-speaking to thousands of people spreading the Gospel of Life as well as making many appearances on EWTN and other local, national and international media. He has recently been awarded the John Cardinal O'Connor Award for Life from Legatus. Allow Fr. Thomas Euteneuer to open your eyes to the too-often-overlooked fact that "Your enemy the devil is prowling around like a roaring lion looking for someone to devour." That "someone" is you and those you love. Fr. Euteneuer reveals the sobering truth about demonic influence and possession - which he believes will increase dramatically in the years to come - and how the Catholic Church's divine power and authority are capable of winning any spiritual confrontation with evil. As an experienced exorcist, he is thoroughly qualified to address this important subject. Romans 1:18-27: "For the wrath of God is revealed from heaven against all ungodliness and injustice of those men that detain the truth of God in injustice: Because that which is known of God is manifest in them. For God hath manifested it unto them. For the invisible things of him from the creation of the world are clearly seen, being understood by the things that are made. 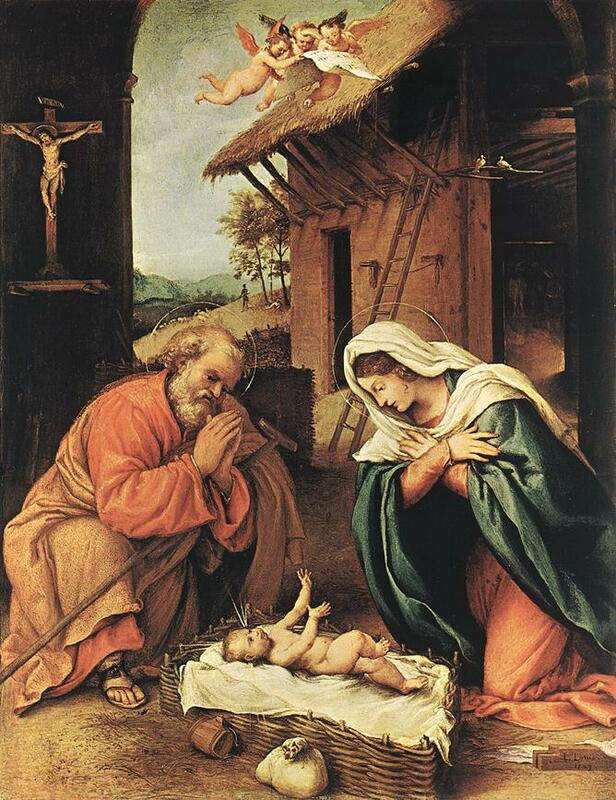 His eternal power also and divinity: so that they are inexcusable. Because that, when they knew God, they have not glorified him as God or given thanks: but became vain in their thoughts. And their foolish heart was darkened. For, professing themselves to be wise, they became fools. And they changed the glory of the incorruptible God into the likeness of the image of a corruptible man and of birds, and of fourfooted beasts and of creeping things. Wherefore, God gave them up to the desires of their heart, unto uncleanness: to dishonour their own bodies among themselves. Who changed the truth of God into a lie and worshipped and served the creature rather than the Creator, who is blessed for ever. Amen. For this cause, God delivered them up to shameful affections. For their women have changed the natural use into that use which is against nature. And, in like manner, the men also, leaving the natural use of the women, have burned in their lusts, one towards another: men with men, working that which is filthy and receiving in themselves the recompense which was due to their error."